North, Jonathan, ed. 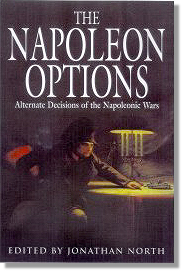 The Napoleon Options: Alternate Decisions of the Napoleonic Wars. London: Greenhill Books, 2000. 208 pages. ISBN# 1853673889. $34.95. Hardcover. Jonathan North has gathered together an expert group of Napoleonic scholars and produced a fascinating 'what if' book on the Napoleonic wars. The Napoleon Options has ten tales to tell —skillfully blending fact and fiction, with footnotes and all— of much fighting and maneuvering on some of the might-have-beens of the period. Until now, I have never been much of a 'what if' reader, even though I do very much enjoy historical fiction and tales of high adventure. This book is better than that. The chapters range from 1796 to 1815, from the abortive invasion of Ireland to the aftermath of Waterloo, and the book is hard to put down. In fact, I got into it so deeply that it was getting very difficult to tell fact from fiction by the end of each chapter, and I didn't even have my favorite cognac handy. Fortunately, or unfortunately as the case may be, there is a 'Reality' section at the end of each chapter to let the reader know the actual outcome. The authors assembled are, in order of appearance, Paddy Griffith, Charles S. Grant, Philip Haythornthwaite, John H. Gill, Digby Smith, Jonathan North, John G. Gallaher, Peter Hofschröer, Andrew Uffindell, and Colonel John R. Elting. Griffith writes on the invasion of Ireland with quite a different, and thought-provoking, outcome. Grant writes with style and panache about the conquest of Egypt and Syria, leaving us with a very plausible outcome for France, all hinging, naturally, on the fate of the French fleet. Haythornthwaite gives a very plausible analysis of a French victory at Vimiero in Portugal in 1808, and Digby Smith tells of a Russian victory at Borodino in 1812, with dire consequences for the French deep within Russia. Jack Gill writes with his usual authoritative pen on an Austrian invasion of Bavaria in 1809, albeit just a little earlier than expected. Jonathan North gives a slightly different view of the operations around Minsk in 1812, which under his skillful pen, changes the course of the Russian campaign in general and the crossing of the Berezina in particular. Veteran historian John Gallaher, the biographer of Marshal Davout and expert on the Legion Irlandaise, gives a stirring account of a victory by Vandamme at Kulm. This time Vandamme was supported by his fellow corps commanders and the French conduct the energetic pursuit that could have clinched victory for Napoleon in the campaign. There are three chapters related to Waterloo, by Uffindell, Hofschrüer, and Col. Elting. Uffindell relates to the reader an alternate fight at Mont St. Jean, but the campaign in the long run still goes against the Emperor, with quite different personal outcomes for both the Emperor and milord Wellington. Hofschröer, once again displaying his expertise with the non-British side of the allied coalition, demonstrates in analytical and articulate prose what could have happened to the allies in Belgium if veteran General Rebecque had not acted with alacrity and moved with professional haste to defend the vital crossroads at Quatre Bras. My personal favorite, however (and which will undoubtedly not be a big surprise to all), is the lively tale told by Col. Elting about the ambush at Quatre Bras by the French 7th Infantry Division directed by the Emperor himself. This may be the last published work of Col Elting, as his passing on 25 May has left an empty place in the ranks of Napoleonic historians that will never be properly filled. Here, he has left us a lively, witty, and completely believable tale of what a relatively small group of determined men can do if properly led and motivated. Here we meet such characters as Captain Jacques Merle of the 1st Hussars, '...so gentle and soft-spoken that fellow officers called him 'Mam'selle', so stark-deadly a fighter that his troopers spoke of him with awed blasphemy...' and Marechal des Logis Chef Gros-Noir, 'a long and gaunt, all bone and whipcord' grognard, with 'a hooked, hawk's beak nose' that 'jutted from his dark face between feral yellow eyes.' In these brief, thumbnail descriptions, Col Elting has described the gamut of the veteran marchers and killers that followed Napoleon for over 20 years, and were ready to do it again, even after Waterloo. This book is highly recommended to all that are interested in the period. The ten authors have done a superlative job of analysis and probability in this work, and it deserves wide reading, if for no other reason that to help all historians, budding or otherwise, with their ability to draw logical conclusions from historic evidence. Jonathan North, in particular, is to be congratulated both for his superlative writing skills, and for his expert skill as an editor.